Fancy an irresistible audio-visual cocktail of effortlessly smooth vocals, exotic looks, catchy hooks and killer abs? 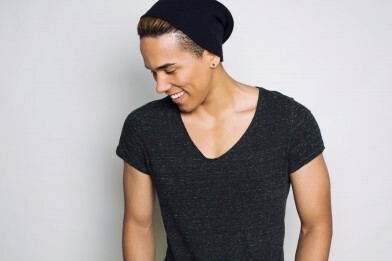 Well, look (OK, stare) no further than emerging R&B/pop singer/songwriter Chris Parham. Born in the US to a mother of German descent and an African/Native American/Irish father, Chris discovered his love for music and songwriting while still at school. He initially started out rapping, but quickly turned to singing, laying down vocal loops and choruses for hip-hop artists such as Faice and Sin. 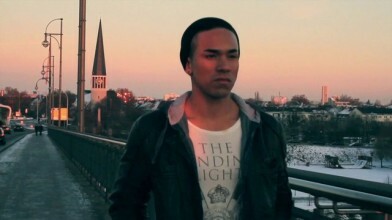 Chris’ first solo singles released in 2010-11, “Baby Can’t You See” and “Diamond Eyes”, are up-tempo dance/electro-R&B ballads in the sure-fire Usher, Ne-Yo, Craig David mold. Via YouTube, he has continued to build his ever-increasing legions of #Parfans, uploading perfectly-executed, emotive covers of songs by Drake, One Direction, Conor Maynard and Mike Posner. Backed by manager Ryan Ashmore and in collaboration with German producer Mark Figuli, Chris has lately begun to head in an intriguing and exciting new musical direction. His R&B/pop sound now has a Prince-esque fresh funk/rock ‘n’ roll edge, and as yet unreleased tracks like “Baby Blue Roses” are true gems-in-waiting. We presume a proper Parham take-over later in 2014! Pop Scoop! caught up with Chris recently for an in-depth chat via telephone. He spoke about the upcoming developments in his musical style, his songwriting process (everything starts out on his smart-phone! ), his musical inspirations, who he would ideally love to collaborate with, the nature of performing live, and the importance of social media for him.